Life can often feel like it’s zipping by in fast forward. We feel obliged to accelerate our own speed along with it, until our productivity turns into frenzied accomplishment. We find ourselves cramming as much activity as possible into the shortest periods of time. We disregard our natural rhythms because it seems we have to just to keep up. In truth, rushing never gets you anywhere but on to the next activity or goal. Slowing down also lets you be more mindful, deliberate, and fully present. When we slow down, we are giving ourselves the opportunity to reacquaint ourselves to our natural rhythms. We let go of the “fast forward” stress, and allow our bodies to remain centered and grounded. Slowing down is inherent to fully savoring anything in life. Rushing to take a bath can feel like an uncomfortable dunk in hot water, while taking a slow hot bath can be luxuriant and relaxing. A student cramming for a test will often feel tired and unsure, whereas someone who really absorbs the information will be more confident and relaxed. Cooking, eating, reading, and writing can become pleasurable when done slowly. Slowing down lets you become more absorbed in whatever it is you are doing. The food you eat tastes better, and the stories you read become more alive. 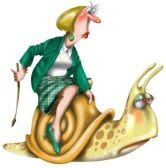 Slowing down allows you to disconnect from the frenzied pace buzzing around you so you can begin moving at your own pace. The moments we choose to live in fast forward motion then become a conscious choice rather than an involuntary action. Learning to slow down in our fast-moving world can take practice, but if you slow down long enough to try it, you may surprise yourself with how natural and organic living at this pace can be. The homeland of the Huichols is remote. It is protected from the outside by the difficult access to its communities in remote parts of the Sierra Madre Mountains in the states of Jalisco and Nayarit. Due to the isolation of its villages, the people have until recently managed to resist all but the most minor modifications from western sources. As a result, their art - synonymous with religious devotion - has remained in tact and intensely personal. The word, Huichol, derived from Wirrarika, is the original name of these indigenous people. It means soothsayer or medicine man. The medicine man is the shaman who links the community with the "other world" from where their creativity pours forth as a gift from their deified ancestors to be given back as offerings to the gods. 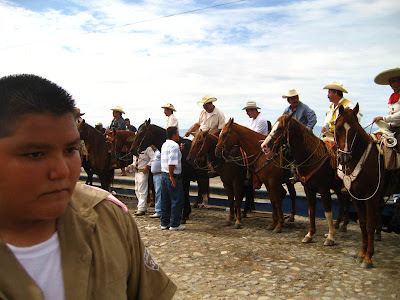 Because the Huichol believe God has given them everything including their talents and abilities, pilgrimages are made every year by families as well as single individuals, young and old, to the sacred land of Wirikuta to hunt the Blue Deer (peyote). They bring with them offerings in return for the gift of making art and entering the priesthood. The ceremonial offerings include pictures, masks and candles and are considered material forms of prayer. The Huichol believe their deified ancient ancestors, the First People, once dwelled in Wirikuta and were driven out into the Sierra Madre Occidental to now live a mortal agrarian existence. The Wirikuta desert is located to the northeast of the present Huichol communities. The pilgrims, led by a mara'akame (shaman) to cleanse the way, travel 600 miles round trip to re-enter the sacred land. During the trip, they perform a series of rituals and ceremonies to transform themselves into deities. At different locations, they adopt more and more of their divine identities and assume the feelings and attitudes attributed to the First People. If the ceremonial thoughts and actions are properly performed, the peyote will be found and "slain" with a bow and arrow. A slice of peyote will be given to each of the "peyoteros" who will then have their own personal visions. They will talk to God, receive instructions about how to proceed and will, thereafter, sing, cure, or create. This moment of the sharing of the peyote is the fulfillment of the highest goals in Huichol religious life. They have traveled to paradise, transformed themselves into deities, communed with the gods with whom they don't stay long, and then return as mortals. From the ecstasy of that experience the artwork of the people is born. In the Huichol culture, there can be no art without religion or religion without art. Religion is not a part of life. It is life. The gods are everywhere including the trees, hills and lakes. Even the lowly stone has a soul. These intensely religious people immerse themselves throughout their lives in this awareness through ritual and the execution of sacred symbols. Art is the people's means of direct communication with the deities. It is meant to ensure prosperity, health and fertility, and bountiful crops. Its application promotes the general welfare of the community and is always functional as well as beautiful. "Jicuri", the peyote plant is prominent in Huichol art. It is the plant of life that promotes harmonious relations with the gods. Sometime it's represented as the original ear of corn because both carry the colors of white, yellowish green, red and blue. Sometimes it's represented as antlers, which is a symbol of the first jicuri. All three representations hold the same meaning in Huichol myth and are interchangeable in symbolic meaning. Another prominent symbol in Huichol art is the serpent. 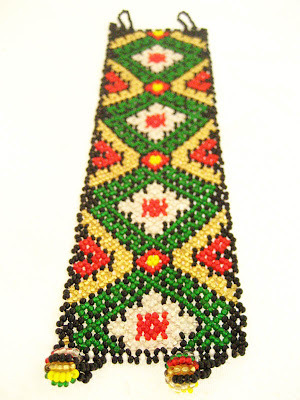 Because it protects corn and peyote, it is one of the most powerful animals in the Huichol cosmogony. Four female deities are represented by the serpent: Rapabiyema, the blue serpent, who lives in the south. Kapuri, the white serpent, who lives in the north. Sakaymura, the black serpent, who lives in the west. And Vaaliwa'me, the earth mother and red serpent, who lives in the east. Takutzi Nakahue, mother of all gods and of corn, with her symbols of the sacred tree, the armadillo, the bear, the water serpent and rain is also well represented. As is Tamat's Kauyumari, the older brother who shaped the world. He can appear in the guises of deer, coyote, pine tree, or whirlwind. Tatewari is the spirit of fire, who lives on earth and is the god of life and health. He is often represented by a reddish-brown color. Tatewari is the chief ally of shamans and accompanies the pilgrims on their journey to Wirikuta. All of these symbols and many more are produced in the highly decorative art form of which the Huichol are masters. Every item, from carved musical instruments to masks and votive gourds, carries heavily symbolic, esoteric, and beautifully rendered symbols. Even clothing is a sacred manifestation of God's work and worthy of prayer in the form of artwork. Huichol men have embroidered symbols and patterns cross-stitched into their clothing. The hems of their trousers often bears the flower pattern of the peyote plant. Boys' hats are decorated with squirrel tails and the feathers of eagles and hawks, symbols of the first peyote hunt. 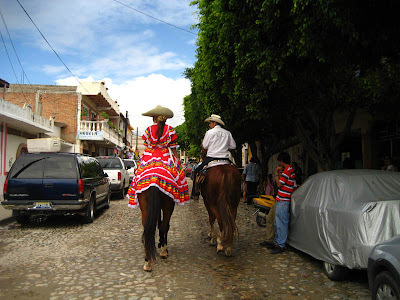 A Huichol in traditional dress on the streets of a dusty Mexican village is a beautiful sight to behold. The Huichol use beads, yarn, and wood in their highly creative and imaginative work. In the market places of the small Lake Chapala villages, one can find a Huichol alone or a family working on beautifully beaded necklaces or earings. 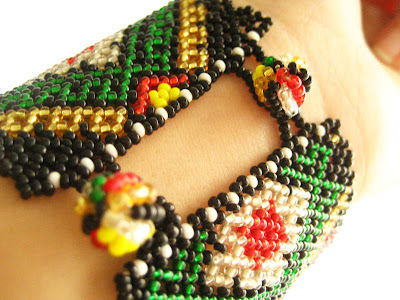 They are using the same tiny beads they use to decorate their masks, votive bowls known as rukuri, and animal figures. Yarn painting, a relatively recent innovation, is very popular with tourists. As with a lot of the beadwork, the surface of a plywood board is first coated in beeswax that is softened in the sun. Strands of colorful yarn in contrasting colors are then pressed into the sun-warmed wax. 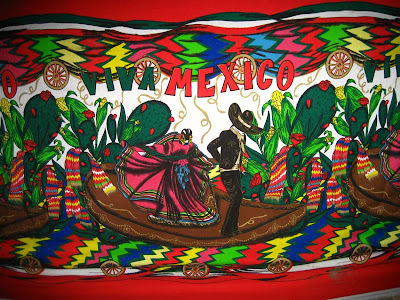 Although the work is still based on interpretations of traditional religious stories, yarn painting has become very much an urban enterprise, and a number of Huichol now derive their livelihood from their art. As a result, many have left their homeland in the rugged and isolated Sierre Madre Occidental mountains to live in small towns and cities where there is an outlet for their creations. Yarn painting is not sacred as it has no place in traditional Huichol culture. However, the subject matter of the paintings represents religious themes such as ceremonies, fiestas, and the gods, and often tells of events from Huichol mythology. In keeping with Huichol tradition, the paintings are not titled but often tell the story on the back. The Huichol will say that when they do their work for God they think of God, and when they do the work for commerce, they do not, but the skill, technique and vision are the same. And it's through God that they have been given their gift. The only sacred yarn paintings are the "nierika" or God's face, which symbolize the threshold or passageway to the supernatural realm. They are small, disc-shaped, devotional objects often deposited in sacred locations as an offering. The other sacred use of yarn is in the "tsikuri" or eye of God. It's a wooden cross with strands of yarn wound about it in a diamond pattern and is a symbol of power to perceive and understand the unknowable. It serves as a type of votive offering to the guardian god of a child. Each year the father adds a section to the object, which is left in sacred places. It's a beautiful object and can be found in the market place. 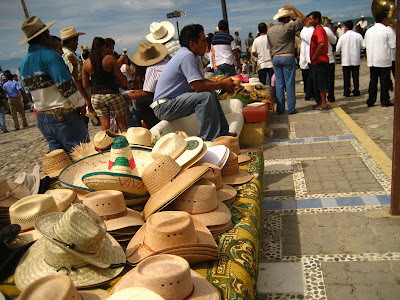 However, by the middle of the twentieth century, modern life started to make in roads into the Huichol community. It became evident to the people that they would have to eventually switch from an agrarian economy to a money-based economy. At the same time, their sacred work drew the attention of outsiders. As a result, they began producing items for expressly commercial purposes. Hundreds of families started to support themselves through making and selling their own artwork consciously adopting new materials and incorporating new objects into their work, though always preserving their original symbols. Pictures by Aida Coronado from the collection Huichol Art, Culture and emotion. A gift from my sisters Chary and Biank! This beautiful drawing was made by my middle sister Chary (Maria Salinovich) a few years ago while visiting from Sonora, in Sayulita, I had saved it a long time. Maria is a very talented artist and loves fashion design, Chary is Always working hard, is very succesful in her Marketing career and she is an amazing bussines woman. She managed all affairs at Económicos de Imparcial back in Hermosillo, Sonora, right now she works on #S, I admire her very much! 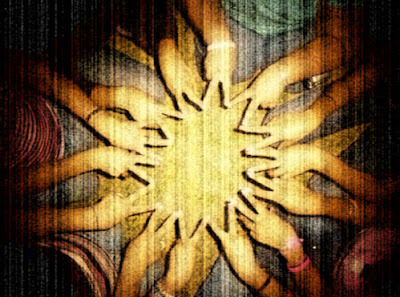 "Estrellita" is a picture of my small sister Bianca and her friends in Lovely Bahia de Kino, Sonora. she is very intelligent and organized, she enjoys long Beach walks, she is a talented photographer, and enjoys helping others! las amo hermanitas! mucho mucho mucho! Love you Maria and Bianca! The Parade! El desfile! 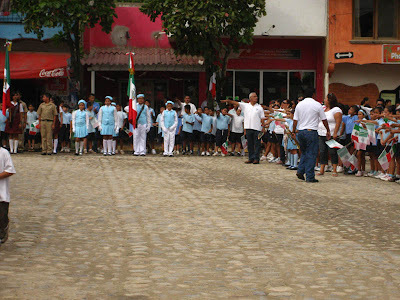 The main square in silence, while we are doing honores a la bandera! 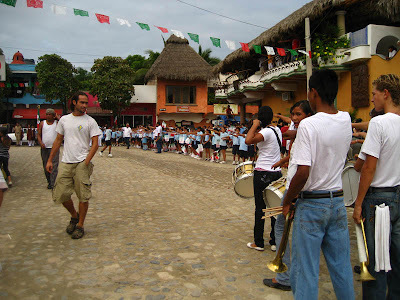 La escolta from the Public schools this is in Sayulita, Nayarit, Mexico La banda de guerra, with drums and trumpets! The dancing horses! I got a video, have you seen a horse dancing? 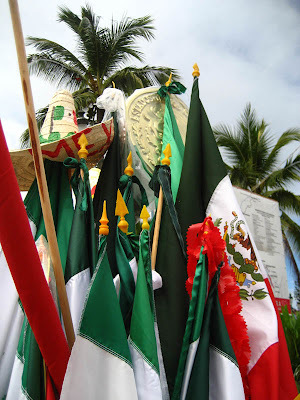 Mexican Flag - Bandera de Mexico, legado de nuestro heroes, simbolo de la unidad de nuestros padres y nuestro hermanos, te prometemos, ser siempre fieles, a los principios de libertad y de justicia que hacen de nuestra patria La nacion independiente, humana y generosa a la que entregamos nuestra existencia. (juramento a la bandera) (pledge of allegiance to the Mexican flag) And the tacos!!! 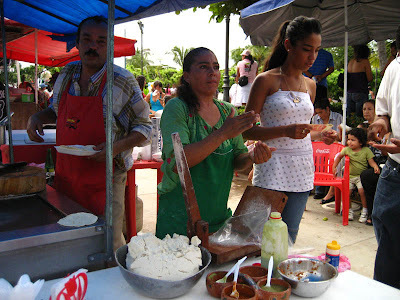 with handmade corn tortillas, ooo yes they are they are making the tortillas specially for your taco! 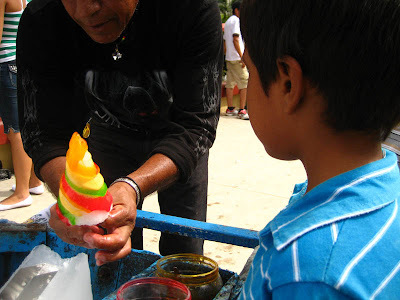 This is a "pirulin" this Mexican dessert is made of shaved ice and covered with pure caramel (several flavors and lecherita in this Mexican one) they are good!!! really good! 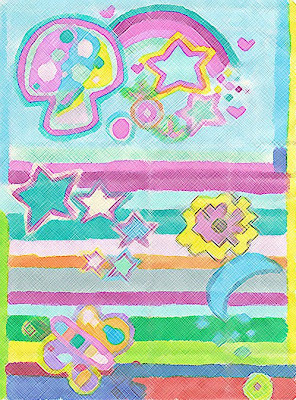 I had many in elementary school and I had one this day! Just waiting...really beautiful and educated girls and Mama!!! 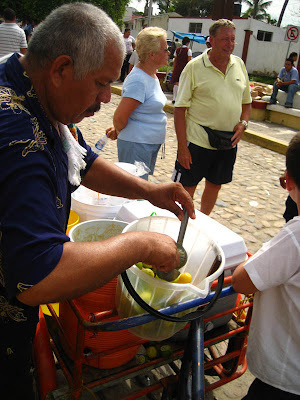 El tejuino, corn, lemon, and ice, it is good, funny beverage texture. A must try of you like different exotic stuff! In Mexico, we celebrate our Independence during two days, the 15th at midnight when The Presidente "Da el Grito" September 16th. 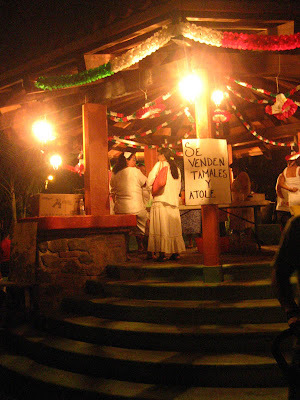 We call this event nuestras Fiestas Patrias, Patria meaning country or more than a country a BIG WIDE United Nation. 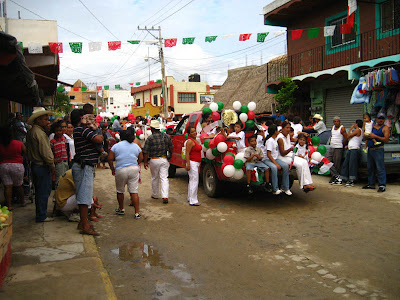 September 16th celebrationa are normally on the main square of every town or city in Mexico. I feel our celebrations is a way to keep us united, our National celebrations are part of our culture and our history. 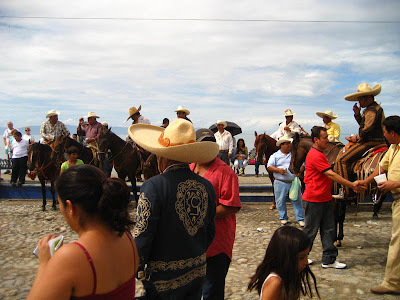 If you are in Mexico, you would notice that we celebrate this big "fiesta" in little towns and big cities as well, the difference between them, remains in the games and the way they present them and the food! the food is very different from town to town, they have chivichangas or chimichangas in Hermosillo, Sonora, the city I was born in, mmm yummi flour tortillas, excellent Carne Asada. 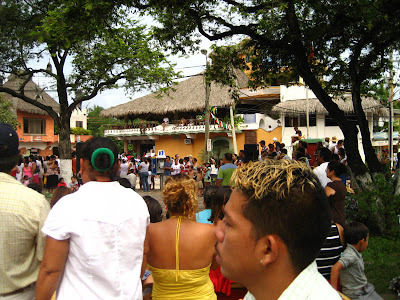 Ok, then this day September 16 2008, we celebrate our INDEPENCE, we scream like crazy people in the streets: a todo pulmon: "VIVA MEXICO", we laugh, dress up with our best Mexican dresses or fancy mexican clothes, kids have fun in the parade, we buy flags, sombreros, we eat (tacos, tostadas, pozole, tamales), say hello to strangers and curios people taking pictures. I think we have in our minds what are we celebrating, the past revolution, Padre Miguel Hidalgo y Costilla, the Bells, but one thing in the Mexican way of living is we are in the PRESENT, we enjoy that day because is a special day, where we can see our Big Mexican family united at least for this reason. 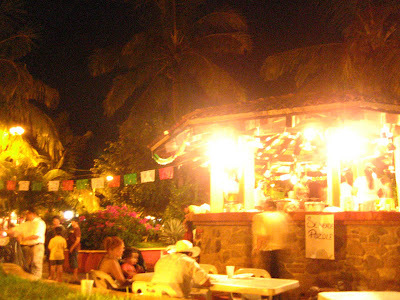 Mexican Independence is a "fiesta" for everybody, we love our roots and we also love sharing them and inviting more people to this party, and guess! we have more coming!!! "November 1 is the day of all little angels(children) that passed away"
and Novemeber 2 for our family is not a party day, we celebrate, but she didn´t like to go out this day, because is a "very special date, this day all the spirits are going home" and we do not have to interrupt them. This November 2 is the first year I will be celebrating with my Dad (que en paz descanse/rest in peace). And I am very excited, my friends and I want to build an altar, a BIG one to celebrate our beloved ones. I am going to do and ofrenda with the food he loved the most! food?? candies! 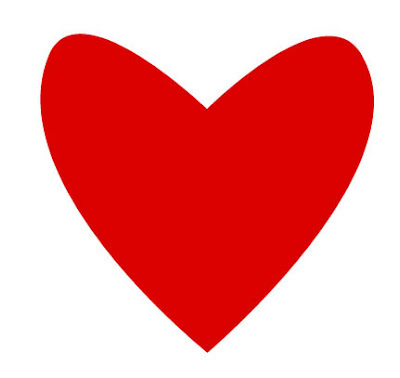 He loved everything with sugar on it and he never had blood or sugar issues, M&M´s, Anis candies, jamoncillo, rollo de guayaba, Zucaritas cereal and more! I will light candles and will love to have some flowers for him. The tradition says all spirits visit earth this day and go to their homes and "eat" the ofrendas and "hang out" with the family for the night. 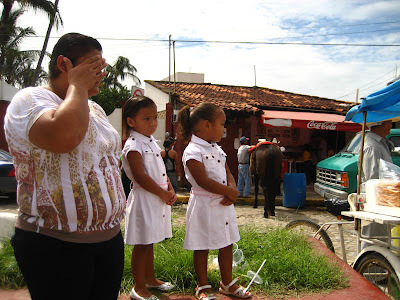 We have a funny way of celebrating "the day of the dead" here in Mexico, and I love it, this is a really special day that you dedicate to think on them, to show (in certain way) them they are always in your thougths and prayers, they already knew that! but we are Mexican and we LOVE BIG "FIESTAS"!!! and WE LOVE "the day of the dead"
I would love to read from you! Visit our store www.aidacoronado.com! we are adding new pieces today! For a simple yet stylish life style. A Huipil is a beautiful traditional Mexican blouse from Tehuantepec with a Magic story, probably the oldest of all traditional garments of Mesoamerica. This GORGEOUS blouse is embroidered on a base fabric of deep Burgundy satin. This top measures 22" across the shoulders, and 20" from the neckline to the bottom edges when this is folded. This huipil can easily be unstitched if desired, adding approximately 3/4" on each side for a total of 1 1/2" wider than measured. 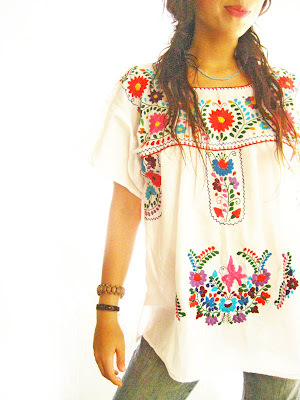 An authentic huipil from Mexico is very beautiful with an embroidered pattern throughout. A combination between classic golds, with stunning flowers. The pattern is on both sides. The blouse is lined with a simple but so Mexican cotton fabric. The photos really show how beautiful this Mexican collection piece is. This Huipil comes from Aida Coronado private collection. It is stunning, colors and patterns that represent a wonderful story from the lady who did the embroidery, it is a way to preserve her culture and traditions and her community in Tehuantepec. It is in mint condition, no sign of wear. 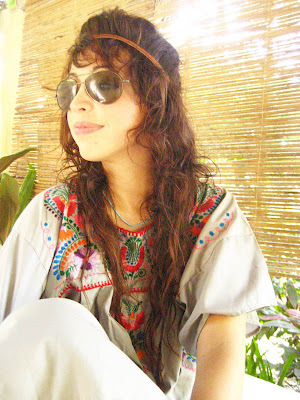 They have been stored for a looong time I found them thanks to a very good friend, this hupil is an original Mexican vintage blouse, they are not a mass produced item for the tourist trade. Please let me know if you would like to know more about the Huipiles magical stories! a lovely and exclusive collection of bohemian-chic-art & culture. Lovely Comments from all over the world! Just as simple and beautiful as I'd imagined and thank you for the incredibly sweet extra! I cannot wait to give my girls their necklaces....thank you so much Aida!~ I hope all is well with you and all the best! Mexican embroidered off shoulder DIVA blouse BOHO CHIC mini dress.